What city and or country you live in? I live in a little town in Queensland, Australia. When I was little and grew up I wanted to be a teacher! I used to love going to school, and still love to learn. (This helps with staying inspired as well! ). I wish I’d never worn? Ohh this one is easy.. Many years ago now I had a pair of pants that I fell in love with when I saw them at the store. They were a burnt orange, brown and straw sort of coloured plaid pattern... Yes really! Thinking back now I really do wonder what I was thinking. I only ever wore them once..
Five things on my desk right now..
My homemade Orange Chocolate Chip cheesecake slice.. What could be better.. Orange, chocolate chips, condensed milk and cream cheese! Saying thank you when people give me a compliment... Like a lot of people am most certainly my worst critic! My favorite movie of all time? The Rocky Horror Picture Show. I've loved it from the very first time I saw it and could watch this over and over, and I'm sure I will! I collect bird cages.. Smaller sized ones for decoration. Actually I just added another to my collection yesterday. I'm not really sure if it's a talent... And it's a bit yuck.. But I can twist my thumb backwards so it sits on the top of my hand... See I did warn you it was yuck! Giggle. If you got a free plane ticket to anywhere, where would you go? It would be to Turkey, to visit Anzac Cove - Gallipoli. It's somewhere I've always wanted to go and would be a very special place for me as an Aussie to visit. I started my creative journey as a scrapbooker, never 12 x 12 size though, always smaller - 6x6 and then for a little while 8x8. I don't do any actual scrapping anymore, I create almost entirely on tags. I love the challenge of the small work surface. I would also never have thought of myself as a stamper.. Stamps used to make me run for the hills..But now I love to use stamps! I tend to find a product I love to use and often find it hard to use anything else.. Ones I find I always reach for are Tim Holtz Distress inks and markers. 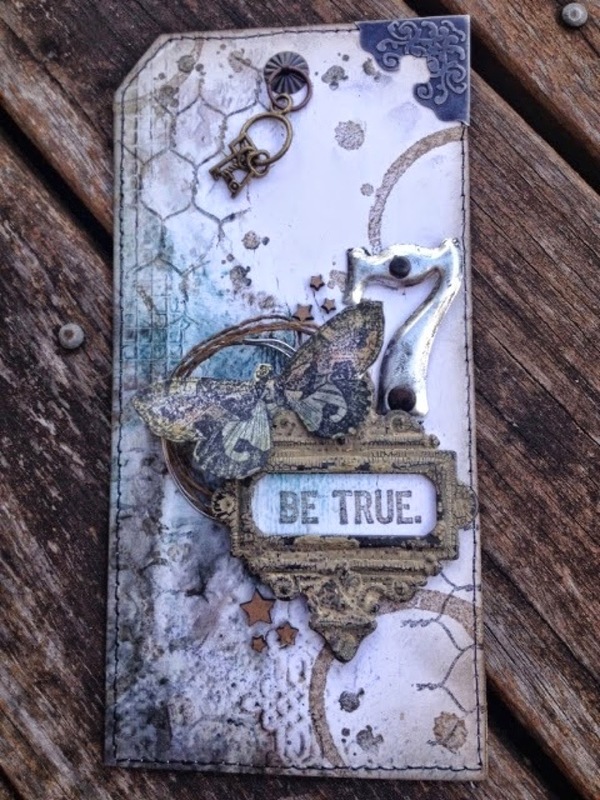 Metal embellishments and trinkets - some faves are of course Tim Holtz Idea-ology, Prima and Graphic 45. Pattern paper - 7Dots Studio is a favourite. I always use Multi Medium, Glossy accents or plain old double sided tape to stick anything down. And though it's not a product, I never feel like a tag is finished unless I've pulled out my sewing machine. How do you get inspired or stay inspired? I stay inspired by regularly visiting my favourite blogs, learning new techniques and also doing little challenges with my wonderful crafting friend Anita, by text.. We each chose a colour, items, technique whatever the case maybe, and give ourselves normally until the next morning to send each other a picture of our completed project. How/where can people find your work? At the moment you can find me @ my blog Alterd & Inked or on Facebook. I tend to post pictures there a bit as well.. Thank you again Karen for sharing your work with us. We are inspired. Nice to meet you! Great interview and I love your tags!!! Congrats Karen! Wonderful interview and I adore all your gorgeous tags! Your tags are beautiful, I especially like that last one. Great interview. Kudos to you my friend, so very happy that it is Your One Lucky Day ! I love when I get introduced to a new Blog that has such gorgeous inspiration. Thank you, Paula! 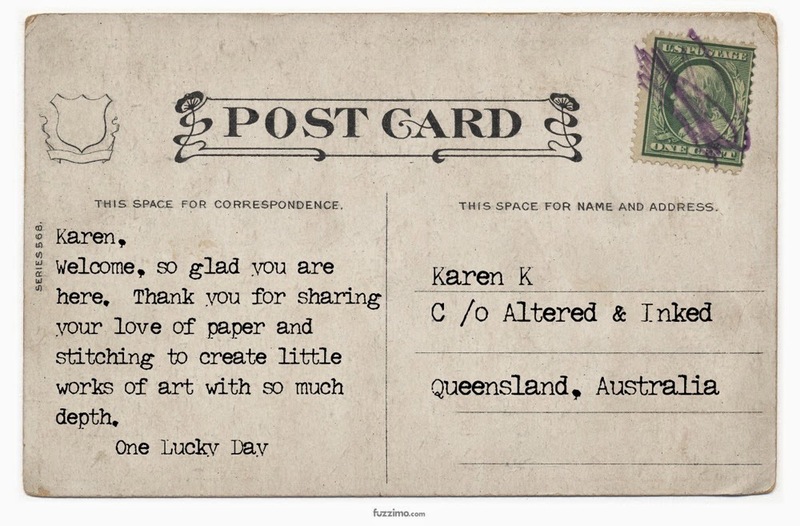 And thank you Karen for letting us peek into your beautiful world. Now I'm off to look around at Altered and Inked! Paula - Karen's tags are amazing! Thanks for featuring her - I enjoyed drooling over at her blog! Amazing tags Karen! Love your style! Thanks so much for sharing. It was fun to get to know you. What gorgeous, gorgeous tags... I'm off to follow Karen! Thanks so much for sharing another stunning talent with us, Paula!